Wisteria Hysteria is the second fragrance from British milliner Stephen Jones, working in collaboration with Comme des Garçons. I liked the first, 2008's Comme des Garçons + Stephen Jones, enough to add it to my buy list but not enough to actually buy it: it's among the many perfumes I would buy if I ever found it at a massive discount. 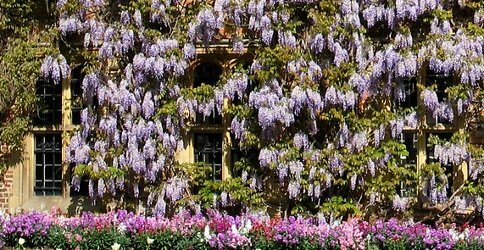 Wisteria Hysteria — what a great name! — costs a little more and I like it a little less, so it's not likely I'll ever own it. The first fragrance from Stephen Jones was meant to be a "violet that's been hit by a meteorite", but while the top notes were a little odd, in general I found it more wearable than the description might imply. Wisteria Hysteria tones down the oddness several notches while staying just inside the Comme des Garçons aesthetic: it's basically a incense-y, wisteria-ish abstract floral from perfumer Nathalie Feisthauer. The opening is very peppery and a little closer to carnation than wisteria,1 although the clove is too light to make it anything like a real carnation (the notes: pepper, clove, frankincense, white wisteria, rose, mate leaf, musk, styrax, benzoin and amber). The heart is more of a blended floral, and as I said above, it's wisteria-ish, sorta-kind-of — anyone looking for a realistic wisteria soliflore will have to go on looking.2 There's some pale rosewater, and maybe some peony or some other light floral, and just a whisper of the mate leaf; it's more sheer than not. The base is a pale, slightly metallic blend of clean incense and clean musk — it's a good fit with the opalescent white bottle (see below) and the white and silver color palette of the film. I believe it is being marketed as unisex, but in the conventional sense (which of course, nobody need care about) it's probably feminine, certainly more so than the original Stephen Jones fragrance. I found the lasting power reasonable enough for an Eau de Toilette. Verdict: Wisteria Hysteria is a pretty, spring-like floral, very wearable, but to my nose, ridiculously overpriced at $165 for 50 ml — and if it was twice the juice for the same price, I'd still think it was too much money for what it is.3 The packaging, admittedly, is lovely. Price aside, I do like Wisteria Hysteria, but as I said above, I liked the original Stephen Jones scent better (and found it more interesting). Wisteria Hysteria is bound to find fans, but I would guess that I won't be alone in thinking it too tame for its name and far less daring than the film. Comme des Garçons + Stephen Jones Wisteria Hysteria is $165 for 55 ml Eau de Toilette. For buying information, see the listing for Comme des Garçons under Perfume Houses. 1. "I have a huge wisteria hanging outside my house,” said Jones, who explained its flowers in August give off “the most amazing kind of carnation peppery scent; that was what [the fragrance] was really based on.” Via Women's Wear Daily, 3/5/214. 2. And I was going to add that looking for a realistic soliflore from Comme des Garçons was probably a waste of time anyway, but then I remembered Series 2: Red / Carnation, which is pretty much a realistic soliflore, or at least, it used to be. I don't know what it's like now with the new restrictions on clove. And there was also a Rose fragrance in Series 2 — that's one of the only Comme des Garçons fragrances I've never tried. 3. For some perspective, the scents in the Series 3: Incense collection from Comme des Garçons are $95 for 50 ml. The lovely Monocle scents (Hinoki, Laurel and Sugi) from Comme des Garçons are $120 each for 50 ml. Unless I'm mistaken, the only more expensive Comme des Garçons fragrances are the original Luxe scents, which are $285 for 45 ml (unless you buy them in Eau de Toilette, in which case they're $165 for 100 ml). The original Comme des Garçons fragrance, still brilliant after all these years, is $105 for 50 ml. Note: top image is Wisteria Sinensis trained along a wall [cropped] via Wikimedia Commons. Not that I was expecting CdG to create the iconic wisteria fragrance… but any recommendations for others to check out? Not that this is much help, but I used to love Chantecaille’s Wisteria – but I think it’s discontinued now. I can’t recall seeing it in the new packaging. Eclat d’Arpege used to have a nice wisteria note as well. That’s probably in production. I haven’t smelled this one, but Acca Kappa do a wisteria scent – but I think they call it Glycine or Glicine. I totally forgot the Acca Kappa, thanks! The CDG Champaca is also a pretty realistic soliflore. Disappointed this one isn’t! Ah, good point, thanks. Made more sense in that series than for Stephen Jones, arguably…since Luxe was about showcasing premium materials. I’m not really disappointed that this isn’t a wisteria soliflore, I just think it’s pretty but a little blah -> it’s the sort of thing I liked better on first sniff than after living with it a few days. Which is bad enough without charging luxury prices. Can’t believe I’ve never tried anything from CDG…unlikely I’ll start with this one, great name notwithstanding. Oh gosh, do try something. Maybe you’ll hate them all, but it’s still one of my favorite lines even though lately I complain about much of what they make. Fair enough. This one is a bit less revolutionary still. Gunpowder and granite dust, I would imagine. Wisteria being my birthday flower (blooms for my birthday) I was so hoping this one would be fantastic. Alas the reviews I’ve read have not been overly enthusiastic. Will try it anway! Well, hopefully you’ll like it better than I did! I know one wisteria perfume, which I got a sample off Luckyscent before they stopped selling it (booo). Its called “The Party Fragrance The Garden Party Wistaria” and is very spendy but I do remember loving my sample and desperately wanting a full size bottle. Doesn’t seem that easy to get. Ah, yes, I do vaguely remember that brand! Thanks. Escentual sells it, and they ship worldwide. Not aff., just use them a lot. Never smelled it myself, but I just saw the pricing on that line – whew! Although it’s worth subscribing to emails from Escentual – a few times a year they do a sitewide 20 or 25% off, which is insane. I know they just finishing one 20% promotion, but I know later in summer they tend to do it again. Once upon a time I wore CdG Rose – it was actually quite a sweet thick raspberry rose from what I remember, very cartoonish. CdG Carnation just took me back to high school when you could order carnations for people on Valentine’s Day and they would delivery them during homeroom. It was a pretty straight up flower shop cooler red carnation – that odd cold refrigerator smell crossed with an almost unsweetened whipped cream like note and some underlying clove. Best clove scent (never smelled vintage Malmaison) to me was always Prada’s boutique exclusive Oeillet (very unisex, rich, velvety clove-carnation). Thanks — never smelled Rose and never smelled one of them from the Sweet series, and maybe another from Synthetic series. I loved the iris note in Sticky Cake from the Sweet series. Always regretted not snapping up a bottle of that. The Carnation, on the other hand, is terrific, a teeth-and-claws kind of carnation scent. I bought a whole bottle of it after trying a Luckyscent sample. I will sniff when I see it in Libs but not rushing…….I know I mentioned this in my comment to Denyse’s review, but I’ve never felt quite the same about wisteria after I read that apparently the Middleton sisters used to be called the Wisteria Sisters in college. You know, pretty and great climbers…..
Ha, that’s hysterical! But I will not let the Middletons affect my perfume choices. What if they’d been called the jasmine sisters, or the incense sisters?